Packed with tons of flavor and spices, Ethiopian food is simple to prepare yet still exotic. The dishes are typically eaten by hand without utensils and shared with others using the same plate. Dining is meant to be an intimate experience. 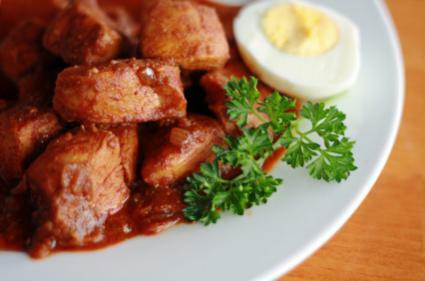 Wat is a thick stew is often served with injera and can feature chicken, lamb, or beef. Spices commonly used include chili peppers, garlic, cumin, allspice, coriander, and fenugreek. Lentils are often served as a side dish or main course. Berbere can be used in dishes featuring fish, chicken, and lamb, as well as in stews and on lentils and grains. It is a powerful spice blend that will add big flavor to a variety of dishes. In a small pan, add the cumin seeds, fenugreek seeds, black peppercorns, whole allspice, and whole cloves. Heat over medium heat, making sure to shake the pan to toast the spices, for two to three minutes. Remove spices from pan and allow to cool for at least 5 minutes. In a coffee grinder or food processor, combine the remaining ingredients with the toasted spices. Grind spices and ingredients into a fine powder. Makes 1/2 cup and can be stored in an air-tight container. 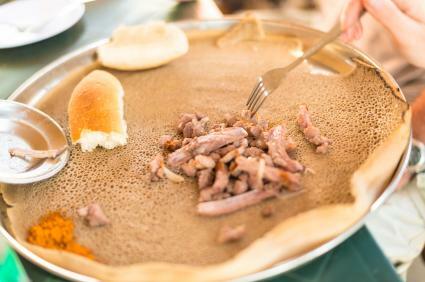 Injera is a type of flat bread used to pick up pieces of food and is a staple at every meal. In a large bowl, mix together all ingredients until a batter forms. Allow batter to sit in bowl for an hour or until it rises and is stretchy. Stir batter to incorporate any liquid that has settled on the bottom of the bowl. Use a blender and add 2 cups of the batter with 1/2 to 3/4 cups of water to thin. Make sure the ending batter is very thin. Over medium heat, preheat a fry pan and pour in batter to make a 1/8 inch bread. This will resemble a pancake. Once batter bubbles over the top, remove from pan and place on a clean towel. Stack bread on a dish to keep warm. The addition of peanut butter in this dish is sure to surprise and delight many diners' palates. Remove skin from chicken pieces and lightly score each piece and set aside. Add the onions and garlic to the pan and sauté for five minutes. Add the berbere seasoning and tomato paste, and reduce heat to low. Slowly add in chicken making sure to stir so each piece gets coated in the sauce mixture. Add the eggs to the pot and continue to cook for 15 minutes. 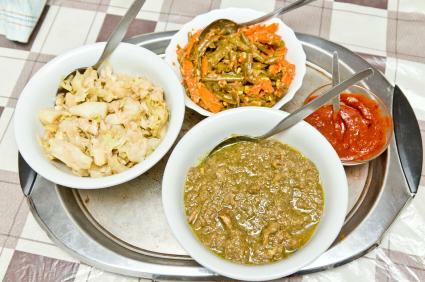 Ethiopian cuisine features a mix of spices, slow-simmered meats, and a range of vegetables and grains. You can take your family and friends on a culinary adventure by preparing some classic dishes that may be simple but feature tons of flavor. It makes for an experience not to be missed. To complement your meal, serve a strong cup of coffee to each guest.